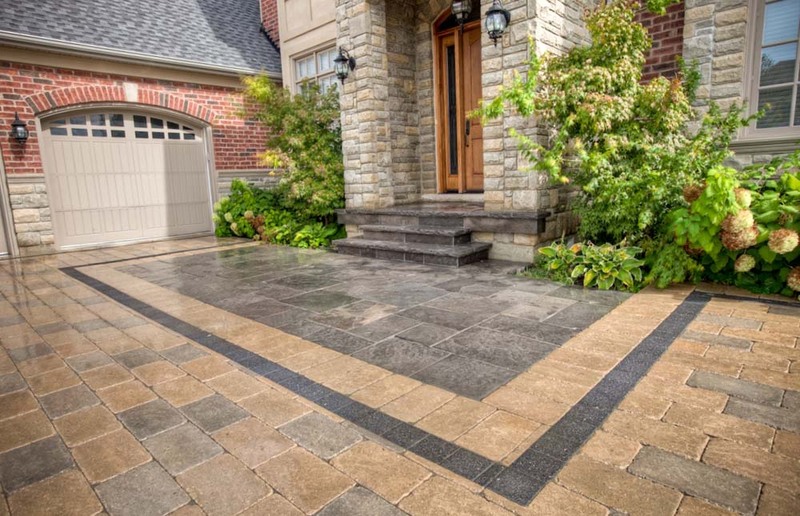 Darsan Contracting is a full service Landscape Design and Build company, with a team of landscape designers, stonemasons and carpenters that will transform your ideas and dreams into reality. 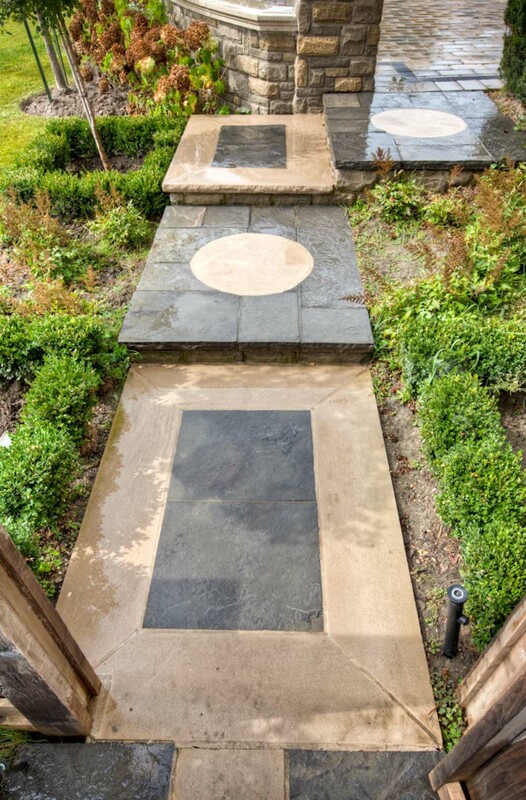 Working with the backyard’s limited dimensions and various grade changes, along with the client’s multiple wish list, we used several design elements and landscape techniques to give this property the ambiance of the grounds at a European hotel. The design not only complements the classic and modern mix of the home, it also provides a tranquil outdoor space for entertaining family and friends. 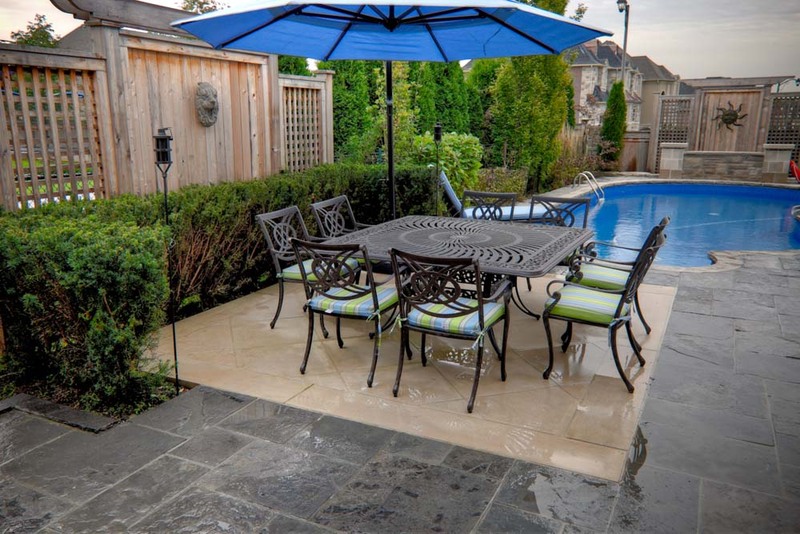 Included was a 28’ x 14’, vinyl-lined pool surrounded by a random, square-cut Owen Sound flagstone deck with Indiana stone inlays. 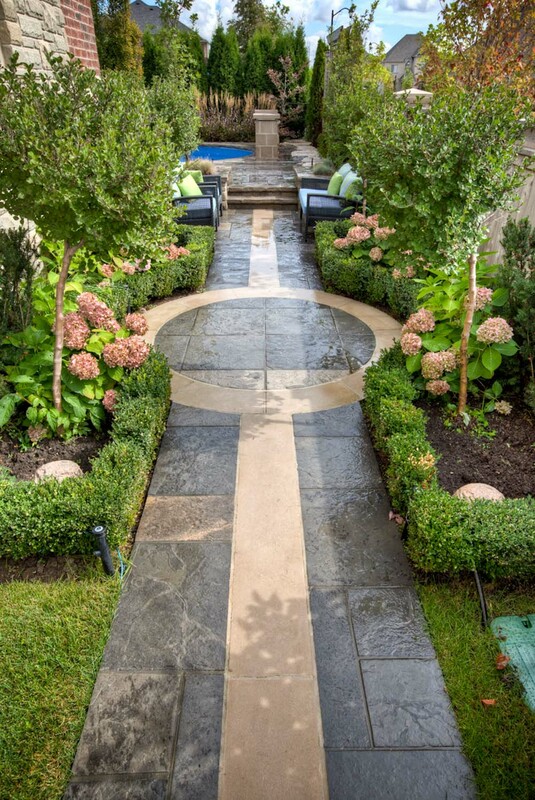 A garden path, designed to resemble a courtyard walkway, continues this theme and features a circular, stone-pattern design that is outlined by low-cut shrubs and flowering plants. Top on the homeowner’s wish list was to include a sophisticated waterfall feature, a large sheltered area for lounging and dining, and most of all, creating privacy in the backyard. 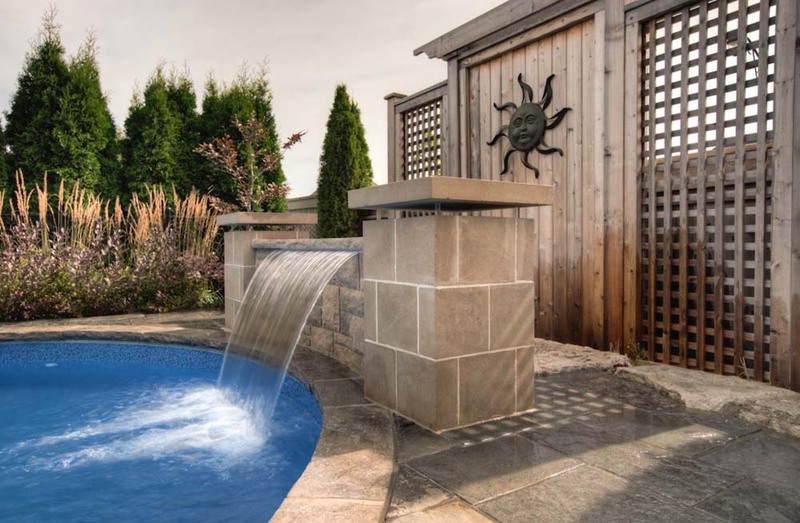 To integrate these requests into the design, we installed a half-wall along the pool’s edge at the farthest end, which includes a 4’ sheer descent waterfall capable of producing a wide range of water effects to suit any mood or environment. A spill over spa, located at the centre of the pool, also features a cascading waterfall that gently pours into the pool. Mere steps away from the pool’s entrance is a large dining and seating area, complete with a large, fully-equipped cabana that houses all the electrical and pool equipment and includes a two-piece bathroom and change room. 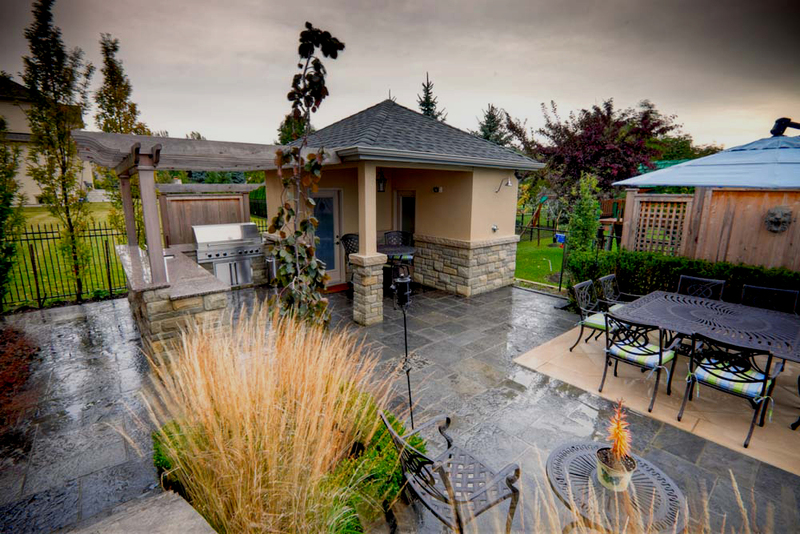 Attached to the cabana is an overhead arbour that provides shade for the outdoor kitchen area, which is equipped with hot/cold running water, fridge and gas barbecue with rotating rotisserie. Landscaping around the yard’s perimeter, comprising of tall trees and hedges, disguises the fact that the location is a residential neighbourhood with houses on either side of the property. Privacy screens made of tongue-and-groove cedar, flowering plants, shrubs and ornamental grasses were also cleverly used to create visual interest in other areas of the yard.